If you're wondering where the heck I've been for the past month I thought you deserved an update! I took a mini blogging break and am feeling super refreshed and SO excited about all of the things going on right now. Thanks so much for sticking around friends! Do you ever feel like even though there are many amazing things going on in your life that you're kind of stuck in this weird in-between phase! While the idea of not knowing "what's next" is a little scary, it's also thrilling. Right now, I'm just going with the flow and enjoying the adventure. 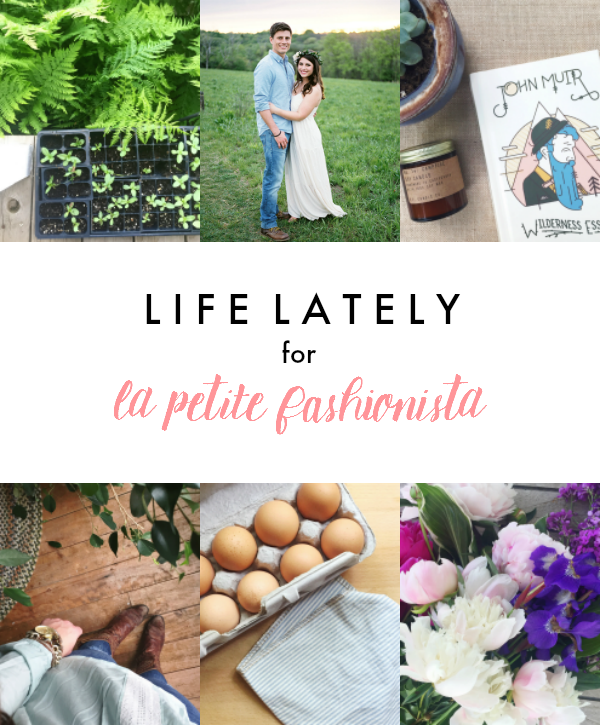 I thought I'd share an update on the latest life happenings and what's coming up on La Petite Fashionista! Lots and lots (and lots) of Wedding Planning: Surprisingly, I haven't been super stressed out during the wedding planning process. Quite opposite actually; I'm having a ton of fun organizing all of the little (and big) details- from growing our own flowers to thrifting for milk glass vases for the tables to choosing our first dance song. Kyle's taking on the biggest job of them all- building wood farm tables for our reception. I'm counting down the days until October 1st! Planning our Honeymoon Itinerary: Right after the wedding we're whisking off Italy for 2 weeks. I'm already dreaming about the wine, pasta, and exploring each of the cities with my future husband -and of course.. what I'll be packing! Sweating for the Wedding: With the wedding 80-something days away, we're both kicking our workout routine into high gear. I have a planner filled with barre classes and we've been trying to grill veggies every night for a lightened up supper. Launching a new Blogging Project: I have a new blogging/brand project in the works. I'm excited for La Petite Fashionista to evolve as I enter the next phase of my life journey.. a tiny sneak peek here. Kyle and I are going to be renovating his family's 100-year old farmhouse. We've been spending almost every weekend out at the farm getting ready for our wedding and reno. It's definitely my "happy place" (I've been posting lots behind the scenes on snapchat @ lpfashionista). A Simplified Summer: I've really been trying to balance our "to-do" list with summer fun! So far this summer we've had lots of first time Wisco visitors which I've loved showing around my city- from pitchers at the terrace to shopping on State street. We also spent a weekend camping at friends. I absolutely loved cooking each meal over the campfire and watching the fireflies at night. Our garden is overflowing with herbs and Kyle loves mixing us up mint vodka lemonades- straight from the garden! What are you most interested in reading about on LPF? Wow Lauren it sounds like you are having a very busy but good summer!! I can't believe you are growing your own wedding flowers and building your own tables -- that is so cool!! I can't wait to see pictures from your wedding, I'm sure it is going to be beyond beautiful! !